Ithaca bed and breakfast travel guide for romantic, historic and adventure b&b's. 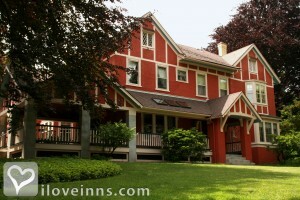 Browse through the iLoveInns.com database of Ithaca, New York bed and breakfasts and country inns to find detailed listings that include room rates, special deals and area activities. You can click on the 'check rates and availability' button to contact the innkeeper. Have you and your family ever been to a place with waterfalls, amazing ice age gorges, magnificent nature views, and unlimited outdoor activities that include hiking, biking, and boating? Ithaca is located beside beautiful Cayuga Lake, the largest of the Finger Lakes. Ithaca boasts of Ithaca College and famous Cornell University. Museums and galleries abound, restaurants, theaters, nightclubs You have a lot of places to visit like the pedestrian mall, the Ithaca Commons, the interactive "planet walk". Stay at any of the Ithaca bed and breakfast and you will certainly ask for more. By Log Country Inn - B&B of Ithaca.